Westlake Village, CA (February, 6 2013) – Guitar Center, the world’s largest musical instrument retailer, in partnership with Eric Clapton, proudly announces the launch of the Eric Clapton Crossroads Guitar Collection. The limited-edition collection will feature five Eric Clapton tribute, replica and signature guitars to be sold in North America exclusively at Guitar Center locations and online at GuitarCenter.com beginning March 21, 2013. Tommy Emmanuel is one of the world’s greatest guitar treasures. He’s on the road pretty much constantly in the US, Europe and Asia; Chet Atkins famously conferred upon him the title of CGP (Certified Guitar Player); and he’s generally regarded as the finest fingerpicker in the world. But his skills were developed from an early age as a child star playing all over Australia in the Emmanuel family band, and he proudly plays Melbourne-made Maton guitars. And Tommy never forgets where he came from, returning home regularly to thrill audiences with his acoustic and electric brilliance. Tommy toured Australia 18 months ago with his brother Phil, and that tour featured plenty of electric guitar playing and a full band. But he’s back right now to play a run of acoustic dates, with special guest Frank Vignola. NAZARETH, PA – January 18, 2011 – In special collaboration with seven-time Grammy Award winning singer/songwriter/guitarist John Mayer, C. F. Martin & Co. is pleased to introduce a very special premium guitar — 00-45SC John Mayer Edition — limited to just 25 very unique instruments. The NAMM news is starting to come in – check out this cool new series from Martin. I’ll be checking out the Martin booth at NAMM on Friday the 15th, so I’ll follow up this post after then with a hands-on report. Nazareth, PA – January 4, 2010 – C.F. Martin & Co. is proud to announce the launch of the “Performing Artist Series,” an innovative line of acoustic/electric guitars set to debut in 2010. 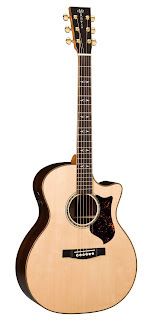 The three models that form the foundation of the new series include the “DCPA1” Dreadnought, “OMCPA1” Orchestra Model, and the new Grand Performance “GPCPA1.” These acoustic/electric models provide flexibility and professionalism for guitarists, from small coffee houses to large arenas to simply recording with your laptop or in a professional studio. These new models combine Martin’s legendary tone and styling, while adding player comfort and on-stage performance capability. The DCPA1, OMCPA1 and the modern Grand Performance GPCPA1 all share the same aesthetic blend of contemporary and traditional features. 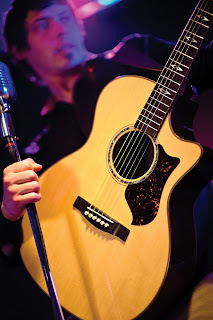 Additionally, all Performing Artist Series guitars are equipped with Fishman’s newly designed onboard sound reinforcement system, the F1 Aura®. Each model in the Performing Artist Series offers its own distinctive acoustic and plugged-in sound for the discerning player. 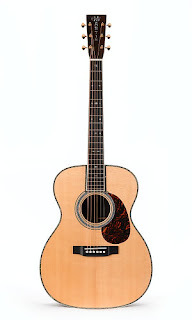 The DCPA1 offers the powerful and resonant Martin Dreadnought tone. The OMCPA1 is well balanced, offering warm bass response with crisp clear trebles. The new GPCPA1 shares characteristics from the big rich sound of the Dreadnought and the clarity of the Orchestra model and combines them into a new sonic signature all of its own. All three guitars share the same well-known Martin construction including solid East Indian rosewood back and sides, a solid Sitka spruce soundboard with hybrid scalloped bracing, a genuine ebony headplate, fingerboard and bridge, and a patented mortise and tenon neck joint. The Performing Artist Series features many firsts for the company, including a more parallel neck profile with a slimmer taper at the 12th fret, giving the guitar comfortable width in the first few frets plus a faster feel for lead-work as you move up the neck. The new smaller bridge design reduces mass and increases the soundboard’s tonal response. Striking new aesthetic features include a pearl Martin block-style logo inlaid into the ebony headplate. New fingerboard inlays use traditional squares in colorful blue paua, flanked by arrow designs adding to the guitar’s sleek modern style. A newly-designed two ring rosette borders the soundhole with a stunning combination of blue paua and wood fiber inlays. Finely polished gloss lacquer highlights the body’s beauty, while a durable satin finish on the guitar’s neck adds to the quicker feel and player’s comfort. The new Fishman® F1 Aura® features the stunning realism of award-winning Aura Acoustic Imaging technology in a distinctive and easy to use onboard preamp system. State-of-the-art features include: digital chromatic tuner, volume and blend controls, independent 3-band EQ for both pickup and image signals, compressor, phase control and an automatic anti-feedback filter with up to 3 notches. The heart of the F1 Aura is its ability to replicate the sound of nine different world-class studio microphones. Fishman engineers have carefully captured images of the sound that these high-quality microphones “hear” and allow you to blend it in with the legendary Gold+Plus under saddle pickup. The preamp design utilizes low-noise components, 32-bit internal processing and 24-bit audio conversion for an incredibly clean and quiet output. A Limited Lifetime Warranty covers all “Performing Artist Series” models purchased from authorized Martin dealers in the U.S. and Canada. To protect your investment, each guitar includes a brown hardshell case. Throughout its long and colorful history, and under the tutelage of successive generations of the Martin family, C.F Martin Guitars have been continuously producing acoustic instruments that are acknowledged to be the finest in the world. The birth of the Martin Company goes back to the late 1700’s Germany where Christian Frederick Martin, Sr. was born and after having taken up the craft from an early age, emigrated to the United States in 1833. During the 1850s, and now based in Nazareth, Pennsylvania, one of C. F. Martin’s major design innovations, the “X” bracing system for the guitar top came to fruition. Still in use in all steel-string Martin guitars today, the bracing system is largely responsible for the distinctive Martin tone, characterized by brilliant treble and powerful bass response. The 20th century ushered in a period of tremendous growth for Martin that eventually peaked in 1928 before the Great Depression of 1929 brought about a reversal in fortune. It was during these darkest years that the company emerged with two major developments that would have lasting effects: the creation of the now famous “Dreadnought” guitar, and the invention of the 14-fret neck. Though an early version of the Dreadnought – so named after a large class of World War I British battleships – appeared in 1916, it was exclusively made for the Oliver Ditson Company, a retail and wholesale distributor. At first these instruments were not very well received simply because there were not many singers using guitars, and solo players felt that the bass on the Dreadnought was overbearing. However, as folk singing became increasingly popular, interest in the Dreadnought increased. The deep bass response of a Dreadnaught was a very unusual feature to musicians used to the clear treble and overall balance of smaller “standard size” instruments. And when the Dreadnought made its way into the hands of country music performers, it also found an appreciative audience. So when the Ditson Company closed shop in the late 1920s, Martin began producing Dreadnought guitars under its own name. The first models were designated the D-1 and D-2. The D-1, like the earlier Ditsons, was a mahogany bodied instrument while the D-2 introduced what may still be the most popular style of steel string guitar; the rosewood bodied Dreadnought. Though all of the early Dreadnoughts featured a 12-fret neck, Martin decided to introduce the 14-fret neck version in 1929 in an effort to increase the guitar’s range and make it a more versatile instrument. Dubbed the “Orchestra Model”, it was so well received that Martin extended the feature to all models in its line. Later renamed the OM-28, it was the first regular Martin guitar specifically designed for steel strings, and it proved so popular that other guitar makers copied it, becoming an industry standard. In 1933 the first D-45 (left) appeared as a custom order for Gene Autry. Autry had wanted a guitar similar in appearance to his idol Jimmie Rodgers’ 000-45, but in the new large body style. The 1930s and 1940s continued to be an active time of development for the company that would lead the company through a period of prosperity in the post-war years due to the rising popularity of country music. With country stars the likes of Hank Williams and Lester Flatt all playing Martins, interest in the guitars soared to new heights. This was further boosted by the explosion of folk music in the 1950s. Many folkie artists of the day such as Judy Collins, The Kingston Trio, Peter Yarrow of Peter, Paul and Mary, (it’s often acknowledged that Peter Yarrow popularized the D-28S) and Woody Guthrie all appeared on stage, TV and their album covers playing Martins. In the late 1960s Paul McCartney and John Lennon both took their D-28 Martin guitars to India during their visit with the Maharishi where they co-wrote many of the songs that appeared on the now legendary Beatles’ White Album. Those D-28s also showed up many times back at Abbey Road Studios and were used for several of the White Album’s acoustic tracks like Mother Nature’s Son, I Will, It’s Been A Long Time, Blackbird, and Rocky Raccoon. In the 1968 Martin re-introduced the famed D-45, as they had not made any D-45s since 1942. And a totally new model the D-41, was introduced in 1969 to fill the gap between the D-35 and the new D-45. This instrument featured pearl borders around the top only, as opposed to the all encompassing borders on the more expensive D-45. Also beginning in the early ’60s, Martin launched a short foray into the world of electric guitar manufacture. Martin had first wet its feet with the electric guitar in 1959 when it started slapping DeArmond pickups onto some of its acoustic guitars; OO-18E, D-18E and the D-28E were laptop guitars with DeArmond pick-ups. But it’s first truly electric guitars didn’t appear until 1962. Consisting of three main models, the “F” series comprised F-50, F-55 and F-65, all hollow bodied electrics with F holes and again fitted with DeArmond pick-ups. The F series Martin electric body shape was closer to the 1930’s Martin F series arch tops. In 1966 Martin replaced the “F” series with the “GT” series that consisted basically of the GT-70 and GT-75 thinline models. It wouldn’t be until a decade later before Martin would introduce a new series of electric guitars; the E-18, EM-18 and EB-18 guitars and basses before bowing out of its manufacture of electrics completely in 1982. With the tremendous interest in acoustic guitars in the early 1970s (which coincided exactly with the new “soft-rock” era of James Taylor, Loggins & Messina, Crosby, Stills, Nash and Young – whom favoured the pre-WWII models – and Seals & Crofts), the Martin company increased production to an unprecedented rate. The 1970s also saw the company in acquisition mode eventually acquiring the renowned Vega Banjo Works of Boston, the Fibes Drum Company – makers of a unique fiberglass drums – the Darco String Company and the A. B. Herman Carlson Levin Company of Sweden, all of which uniformly lost money for the company. Martin debuted the D-76 Bicentennial model in 1976 and shortly thereafter followed it in late ’76 with the HD-28. The HD-28 was a conscious effort to remake a guitar from the past—the prewar herringbone D-28. Like the early Dreadnoughts, it featured scalloped top braces, a small maple bridge plate, and herringbone marquetry around the top. This bow to the past was to prove to be a very popular model. In the early 1980s, the company slumped to its lowest ebb since the Great Depression years. The decade proved to be one of it’s darkest in its history, with the only new addition to any guitar line being the JM (now called simply J) model in 1985 which followed on its predecessor the M sized model back in 1977. The 1990s would see the company eventually returning to its former glory days. In 1994, Martin issued a recreation of Gene Autry’s famous 12-fret D-45 which bore a list price of $23,000! And in 1995 Eric Clapton collaborated with Martin on a limited edition 000-42 (right) with a number of other special features. Only 461 were made (the figure commemorates Clapton’s 1974 ‘comeback’ album “461 Ocean Boulevard”) and the project was so successful that Martin went on to develop a signature Clapton model, the 000-28EC which is currently available under the Vintage series. And in 1996 a collaboration with “MTV Unplugged”, would yield a highly unusual Dreadnought that mixed both rosewood and mahogany tonewoods with MTV conceived inlay patterns. As the company heralded in the 21st century and looked forward to the future, it also celebrated its one millionth Martin guitar to roll off its production line. Joe Matera is the lead guitarist with Australian rockers GEISHA. He is also a respected music journalist whose interviews appear in countless guitar magazines around the world from ‘Australian Guitar’ and ‘Guitar & Bass’ to ‘Performing Musician’ and ‘Guitar World’. He’s interviewed everyone from Aerosmith, Tool and Motley Crue to Steely Dan, Black Sabbath and Cheap Trick.